During a shopping trip to a business (Duval Container Company site image) in an industrial area in the core city of downtown Jacksonville, Duval County, Florida on 2/13/2009 Dr. Harry G. Lee discovered a colony of Bulimulus - a Bulimulus species that defied identification and was temporarily dubbed Bulimulus sp. aff. guadalupensis (Bruguière, 1789) West Indian Bulimulus. 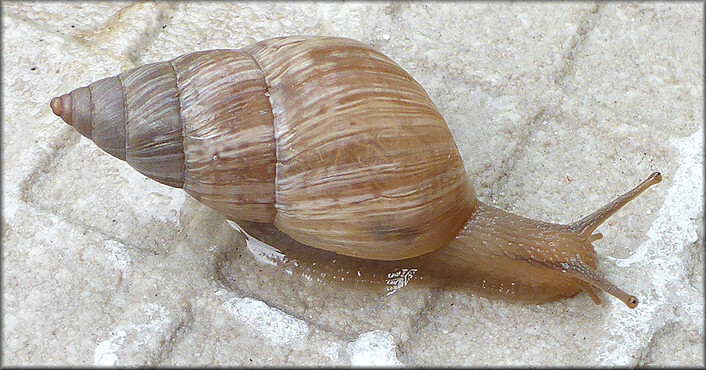 Bulimulus guadalupensis are not uncommon in southeastern Florida, where they were introduced from the West Indies. However, the Jacksonville Bulimulus find (over 200 miles from the nearest known Bulimulus population) represented the first time that a Bulimulus of any ilk has been recorded from northeast Florida image of specimen. As all four known populations of the species were in close proximity to CSX Transportation rail lines, this reporter theorized that the species was being introduced/spread by CSX rolling stock (i.e. dropping off passing trains). Therefore to test this hypothesis, an intense effort was made to find additional populations along CSX Transportation lines. This effort proved to be extremely successful and additional populations were discovered in Duval County as well as a population in Palatka, Putnam County, Florida and Keystone Heights, Clay County, Florida - both some 65 miles south of Jacksonville (see a chronology of the Bulimulus population finds below). On 11/8/2012 information was received from Dr. David Robinson (USDA APHIS PPQ NIS) that the unidentified Duval, Nassau, Putnam Counties Bulimulus species had now been found in a CSX railroad yard at 62nd St. in Tampa, Hillsborough County, Florida - a location some 250 miles southwest of Jacksonville. The USDA identified the species as Bulimulus sporadicus. The question remains as to where this new Florida exotic Bulimulus species is originating to be spread by railroad rolling stock. During the course of the surveys in Duval County this reporter had a conversation with a member of CSX Transportation railroad police who indicated that some of their rolling stock originates in Mexico and that human stowaways were a recurring problem. According to the USDA, Bulimulus sporadicus has also been found in Houston, Texas (no further information). However, the discovery of two very large and obviously long established Bulimulus sporadicus populations adjacent to the Jacksonville Talleyrand marine port facility during August, 2014 suggests that the species could have initially originated at the port and subsequently spread throughout the county by CSX rolling stock. On 9/6 and 7/2012 this reporter surveyed the CSX rail line for a distance of about seven miles along North Main Street north of the Marble Masters Bulimulus population. During the two surveys four additional Bulimulus populations were found (Eastport Road - 11500 block of North Main Street image of specimens - site image, Setzer Road - 10200 block of North Main Street image of specimens - image of specimen on tracks, Franklin Avenue - 10000 block of North Main Street image of specimens, and Clark Road - 9600 block of North Main Street image of specimens - site image bringing the total number of locations along this rail line where the species is present to six and encompassing a distance of 4.5 miles. It should also be noted that during the survey two new populations of Praticolella mexicana K. Perez, 2011 were also discovered. Praticolella mexicana is commonly found in south Florida but only recently (2009) made its appearance in the northeast of the state. On 9/13-14/2012 the CSX Transportation railroad line just south of West Beaver Street (the same area of town where the Bulimulus were initially found at the Duval Container Company in 2009) was surveyed and and five locations were checked. Of the five, three had a thriving population of Bulimulus and at two locations Praticolella mexicana were found. Sites with Bulimulus populations were the Stockton Street image of specimens - site image, King Street image of specimens - site image, and McDuff Avenue image of specimens - site image railroad crossings (see map below). The Stockton Street location had an extremely large population - the largest seen thus far found at any location - and were present on both the east and west sides of the street. On 9/16/2012 yet another CSX Transportation railroad line in the same area of town was surveyed. A small population of Bulimulus was discovered at the CSX railroad crossing near 2096 Dennis Street site image. This location is not far from where Harry Lee initially discovered the Bulimulus behind the Duval Container Company but is on a different railroad line (see map below). Additionally, it was discovered that the Duval Container Company population had spread considerably with Bulimulus present on abandoned buildings and under vegetation/debris on South Myrtle Avenue to at least Elm Street which is a considerable distance south the Duval Container Company. On 9/21/2012 the CSX Transportation railroad line just south of West Beaver Street was surveyed further to the west and a large thriving Bulimulus population was found at the Lane Avenue railroad crossing site image. The snails were present on both the northeast and southeast areas of the crossing. This location is 2.8 miles west of the previously known westerly population on this railroad line at McDuff Avenue. On 10/11/2012 the CSX railroad line that runs through Palatka, Putnam County, Florida was investigated - a location about 65 miles south of Jacksonville. This line is the same line along which Bulimulus were found at the Dennis Street railroad crossing in Jacksonville. This line is also utilized by Amtrak for their east coast service. Two live Bulimulus adults were found in a field immediately adjacent to the tracks in Palatka directly across from the Palatka Amtrak station site image. Also present were a large number of Praticolella mexicana - the only known location in Putnam County where this species has thus far been found. This find of Praticolella suggests that this species too is being spread/dispersed by rail. However, unlike the Bulimulus which have thus far only been found adjacent to CSX railroad lines, Praticolella have been found at three locations in northeast Florida where a railroad line was not present. On 11/26/2012 a thirteenth Duval County Bulimulus sporadicus population was discovered at the Mc Quade Street CSX Transportation railroad line crossing - a location in the core city of Jacksonville located midway between two CSX switching yards site image. The snails were found on both the north and south sides of Mc Quade street on the west side of the tracks. On 3/15/2014 a fourteenth Duval County Bulimulus sporadicus population was discovered in low vegetation along West Church Street just west of the intersection of North Myrtle Avenue in the core city of Jacksonville site image. Empty Praticolella mexicana shells were also present. The same date, several live Bulimulus were also discovered on a building on the west side of North Myrtle Avenue neat the intersection of West Adams Street. This suggests that Bulimulus are present in that entire block of North Myrtle Avenue south of West Church Street and west of North Myrtle Avenue. During a field survey on 4/14/2014 a pair of live Bulimulus sporadicus were discovered in vegetation along the CSX Transportation railroad line just south of the Rosselle Street crossing in Jacksonville. This site had previously been surveyed during 2013 and no Bulimulus were found. It should be noted that this railroad line is the same line that runs through Palatka in Putnam County, some 60 miles distant, where live Bulimulus were found on 10/11/2012. On 6/6/2014 an Email was received from Cory Penca (Florida Department of Agriculture and Consumer Services) reporting that snails resembling Rabdotus dealbatus (Say, 1821) [Whitewashed Rabdotus] had been found in Ruskin, Hillsborough, Florida. The images of the snails provided by Mr. Penca are without a doubt Bulimulus sporadicus. Follow-up information revealed that the snails were found within 600 feet of a CSX Transportation railroad line that runs through Ruskin. On 7/9/2014 the CSX Transportation railroad line was surveyed between the known Bulimulus sporadicus populations at the Lane Avenue railroad crossing and the Halsema Road railroad crossing; a distance of about six miles. During the course of the survey three new locations housing Bulimulus populations were discovered which included the Hammond Boulevard railroad crossing, the Devoe Street railroad crossing site image, and the Addor Lane railroad crossing. While live specimens were found at Hammond Boulevard and Devoe Street, only empty shells were found at Addor Lane - but in large numbers. During a field survey on 8/9/2014, a Bulimulus sporadicus population was discovered at the CSX Transportation railroad crossing on Alta Drive near the intersection with New Berlin Road in far eastern Duval County. Both living specimens and empty shells were present. This is the farthest east that that the species has been found to date and it is about five miles east of the closest known Bulimulus population site image. On 8/10/2014 a single empty Bulimulus sporadicus shell was discovered at the CSX Transportation railroad crossing on Eastport Road just north of the intersection of Kraft Road and south of Faye Road in northeastern Duval County. This railroad line connects with the line where the Bulimulus population was discovered the previous day (see above entry). During a survey on 8/12/2014, a Bulimulus population was discovered along North Main Street near the CSX Transportation railroad crossing at Busch Drive. A small number of both living and empty specimens were present. This location had previously been surveyed several times during September, 2012 and no Bulimulus could be found - although the species was present at five other locations along North Main Street. Later during the same trip, additional large Bulimulus populations were discovered at the CSX Transportation railroad crossings at Buffalo Avenue near 50th Street East and Wigmore Street near Santa Claus Lane image of specimens. The extremely large number of empty shells and wide dispersal at the latter location suggests that the species had been present for a long period of time. During a survey on 8/14/2014, a large Bulimulus sporadicus population was found at a CSX Transportation railroad crossing on Talleyrand Avenue near the intersection with Bond Avenue in Jacksonville site image. The very large number of empty shells present and wide dispersal suggests that this population as been present for a long period of time. Subsequent surveys during late August/early September revealed that Bulimulus were in fact present at all four railroad crossings on Talleyrand Avenue. On 8/15/2014, a pair of empty Bulimulus sporadicus shells were found along the CSX Transportation railroad crossing on East Beaver Street - a location over half a mile south of the nearest Talleyrand Avenue site. A modest number of live specimens were subsequently found at this location on 9/1/2014 site image. These finds suggest that the species is widespread in this part of Jacksonville near the Talleyrand Marine Terminal which is criss-crossed by railroad lines and also sees heavy truck traffic. During a follow-up snail survey on 8/17/2014, Bulimulus sporadicus were found at three additional CSX Transportation railroad crossings in the core city of Jacksonville to include the crossings at Martin Luther King Parkway site image, Evergreen Avenue near 7th Street site image, and 8th Street East just east of Ionia Street. Live specimen and empty shells were found at all three locations but were particularly common at the Martin Luther King Parkway site. During a field survey on 8/19/2014, Bulimulus sporadicus were found at three additional CSX Transportation railroad crossings in the core city of Jacksonville to include the crossings at Buckman Street just north of East 30th Street, Evergreen Avenue near East 27th Street, and East 21st Street just west of Evergreen Avenue. During a survey on 8/23/2014, Bulimus sporadicus were found at the CSX Transportation railroad crossing on North Pearl Street near West 15th Street in the core city of Jacksonville site image. A modest number of both living specimens and empty shells were found. This particular railroad line had recently been surveyed both east and west of this location and no Bulimulus could be found. During a survey on 8/24/2014, Bulimulus sporadicus were found at the CSX Transportation railroad crossing on Carmen Street just south of East 11th Street. Both living specimens and a very large number of empty shells were present. During the trip, Bulimulus were also found on East 8th Street just west of Phoenix Avenue. The snails were present on both the north and south side of the street and the population extended west to at least Walnut Street. During a field survey on 9/8/2014, Bulimulus sporadicus were found at the CSX Transportation grade level railroad crossing on Soutel Drive south of New Kings Road. A modest number of empty shells and live specimens were present. An additional small Bulimulus population was found at a railroad crossing on Old Kings Road and another population nearby at the Norfolk Southern Railroad crossing near the Simpson Yard. Only a modest number of live specimens were seen at this location but empty shells were abundant. During a collecting trip on 9/10/2014, Bulimulus sporadicus were found along Faye Road near the CSX Transportation railroad crossing near the intersection of Faye Road and Alta Drive site image/image of specimens. A modest number of living specimens and one empty shell were present. Interestingly, because of other species of interest found in this area, this location had been surveyed on a regular basis since December, 2012 and no Bulululus were ever found. This probably indicates that the species is a recent arrival at this location. During a field survey on 9/15/2014, Bulimulus sporadicus were found near the CSX Transportation railroad crossings on North Market Street south of East 14th Street and on North Liberty Street south of East 14th Street. Although Bulimulus were not seen at the two railroad crossings, they were seen aestivating on buildings both north and south of the respective crossings. During a field survey on 9/17/2014, a Bulimulus sporadicus population was found near a railroad crossing just east of the Jacksonville Zoo and Gardens on Heckscher Drive just east of Somers Road South site image. It appears that the railroad line belongs to CSX Transportation but no signs were present. During a field survey on 9/19/2014, Bulimulus sporadicus were found at the CSX Transportation railroad crossings on Haydon Road, Gun Club Road and Busch Drive North. While Haydon Road had a thriving population, the other two localities had only a limited number of empty shells despite the fact that all three locations are in close proximity to each other. During a visit to the Clay County County Fairgrounds on 9/20/2014, Dr. Harry Lee's daughter Claire discovered a single living specimen of Bulimulus sporadicus at the facility image of specimen. The fairgrounds are located on State Road 16 about 4.5 miles west of Green Cove Springs, Florida which is the location of the nearest railroad line. Since Bulimulus sporadicus have been found along this railroad line both in Jacksonville and Palatka, Putnam County some 60 miles south, it would appear likely that other Bulimulus populations are present but have yet to be discovered. However, the means by which Claire's living specimen was transported to the fairgrounds remains a mystery. It should be noted that less than a month before Claire's find that this reporter surveyed two locations along the railroad tracks in Green Cove Springs and no Bulimulus were found. This is the first record of the species from Clay County. In an E-mail of 9/28/2014, Mr. John Slapcinsky, Malacology Collection Manager at the Florida Museum of Natural in Gainesville, Florida reported finding empty Bulimulus sporadicus shells alongside or very near railroad lines all around Port Wentworth, Savannah, Georgia earlier that same date. To the best of our knowledge, this is the first report of this species being found in Georgia. During a field survey on 10/19/2014, Bulimus sporadicus were found along the CSX Transportation railroad tracks just east of of the Blasius Road railroad crossing in northeastern Jacksonville. Several empty shells as well as a single live specimen were seen. During a field survey on 10/28/2014, Bulimulus sporadicus were found at the Intermodal terminal of the Florida East Coast (FEC) Railway located at 6140 Philips Highway - a location immediately adjacent to the FEC's massive Bowden Yard site image/image of specimens. Both living specimens and empty shells were present. Empty shells were also found in the roadside swale along Philips Highway southeast of this location for a distance of about .25 miles. Previously FEC tracks both north and south of the Bowden Yard were surveyed and no Bulimulus were found. This find is the first association of Bulimulus sporadicus with the Florida East Coast Railway. During a field survey on 11/2/2014, a modest number of Bulimulus sporadicus were found in the 7100 block of Philips Highway at the main entrance to the FEC Railway's Bowden Yard. Although both empty shells and live specimens were found near the entrance, no specimens could be found in the area of the actual railroad tracks. While in the area, this reporter was approached by a railway policeman. During the course of our conversation Bulimulus were discussed and he was shown several specimens. Much to my surprise he recognized the snails and directed me to the FEC tracks beneath beneath the University Boulevard overpass where he said they were everywhere site image. He was absolutely correct in his observation thus leading to the second find of the day. The University Boulevard overpass is about 0.5 miles north of the FEC Intermodal terminal (see above paragraph) and just north of the Bowden Yard. During a field survey on 11/24/2014, Bulimulus sporadicus were found at the CSX Transportation railroad crossing on Edgewood Avenue North near the intersection with West 20th Street. A modest number of both living specimens and empty shells were present. During a field survey on 12/1/2014, Bulimulus sporadicus were found at the CSX Transportation railroad crossing on Civic Club Drive near the intersection with Moncrief Dinsmore Road. A modest number of living specimens and empty shells were present. During a field survey on 12/3/2014, Bulimulus sporadicus were found at the CSX Transportation railroad crossing on Dunn Avenue near the intersection with Moncrief Dinsmore Road. A modest number of living specimens and empty shells were present. This location is 655 yards north northwest of the Civic Club Drive site discovered on 12/1/2014. During a field survey on 12/9/2014, Bulimulus sporadicus were found at the Talleyrand Terminal Railroad Company railroad crossing on Buckman Street just north of the intersection with with East 16th Street site image. A large number of empty shells were present but only three live specimens could be located. 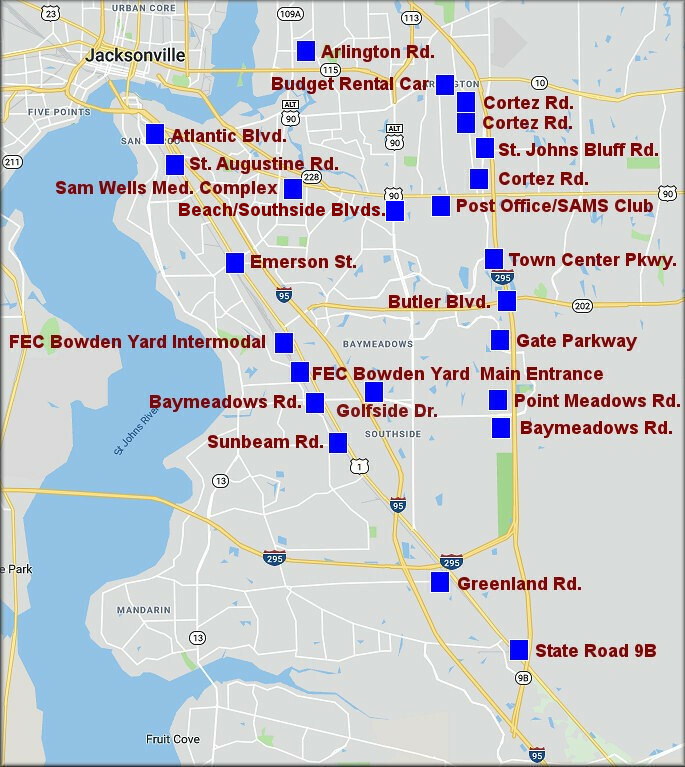 The Talleyrand Terminal Railroad Company is a short line terminal railroad which serves the Jacksonville Port Authority and and tenants with over ten miles of track. The company's tracks connect with those of CSX Transportation and the Norfolk Southern Railroad. On 12/15/2014 Bulimulus sporadicus were discovered along a CSX Transportation railroad line adjacent to Deer Street beneath the New Kings Road (US-1/23) overpass. A very large population of living specimens and many thousands of empty shells were present. The presence of Bulimulus at this site was initially identified from this reporters home using Google Street View (snails plainly visible on concrete bridge structure) and confirmed an hour later by an on-site visit. During a field survey on 12/25/2014, Bulimulus sporadicus were found at the probable CSX Transportation railroad crossing on Commonwealth Avenue just east of Lane Avenue. A modest number of empty shells were present. No live specimens could be found. During a field survey on 12/28/2014, Bulimulus sporadicus were found at the CSX Transportation railroad facility/yard at the dead end of Old Kings Road just west of New Kings Road site image. A large number of empty shells and a single live specimen were seen. During a field survey on 1/6/2015, Bulimulus sporadicus were found at the CSX Transportation railroad facility beneath the Pritchard Road overpass just west of Interstate 295 site image. A modest number of empty shells and living specimen were seen. This location is known as CSX Transportations "Duval Ramp." During a field survey on 1/22/2015, Bulimulus sporadicus were found near the railroad level junction at Crawford, Nassau County, Florida. This junction is where the CSX Transportation tracks (north-south, dual tracks) intersect with the Norfolk Southern Railroad tracks (east-west) site image. The snails, of which only empty shells could be found, were found in proximity to the Norfolk Southern Railroad tracks. This location is less than half a mile from the location along US-301 where Bulimulus sporadicus were discovered during 2010. It's uncertain whether this recent find represents an entirely new Bulimulus population of whether the snails have colonized the entire area near this busy railroad junction. During a field survey on 2/14/2015, Bulimulus sporadicus were found near a crossing of Norfolk Southern Railroad tracks on an unnamed street on the north end of North McDuff Avenue. Both empty shells and living specimens were found. This location is immediately southwest of CSX Transportation's Moncrief Yard. See: http://youtu.be/RZH4sjbrB-g for a video of the site and some of the snails found. During a field survey on 2/26/2015, Bulimulus sporadicus were found along the Norfolk Southern Railroad tracks located at the north end of Line Street at the intersection with West 2nd Street in the core city of Jacksonville. Both empty shells and living specimens were found. During a field survey on 5/5/2015, Bulimulus sporadicus were found at the northern end of Evergreen Avenue at the intersection of Virginia Street. Both living specimens and empty shells were present. Although there is currently no active railroad line in this area, a CSX Transportation railroad spur line is in fact present but appeared to have not been used in many years and was in serious disrepair. On 5/14/2015 an Email with images was received from Mr. Ken Ceglady requesting identification of snails "found on pavement" at Jacksonville International Airport (JIA) that same date. The snails depicted in Mr. Ceglady's images were identified as Bulimulus sporadicus. The extent of the Bulimulus population at JIA is currently uncertain. However, there was some concern by JIA personnel that the presence of the snails at the airport could attract birds which might prey on them and thus pose a bird strike hazard to the safe operation of aircraft Bulimulus sporadicus From JIA. During a field survey on 5/20/2015, Bulimulus sporadicus were found along a long abandoned, presumably CSX Transportation, railroad line along Somers Road which runs south southeasterly off Heckscher Drive. Both empty shells and living specimens were present. The serious disrepair of the railroad tracks and the size of the trees growing between the rails indicates that this railroad spur line has not been used for many years and thus may be one of the oldest populations of Bulimulus sporadicus thus far found in northeast Florida site image. During a field survey on 5/22/2015, Bulimulus sporadicus were found adjacent to a CSX Transportation railroad spur line on Heckscher Drive just west of the bridge over the Broward River. No empty shells were seen but about a dozen living Bulimulus were present. The absence of empty shells suggests that the snails just recently arrived at this location site image image of specimens. During a trip to the U. S. Post Office at 11700 Beach Boulevard on 6/1/2015, three living Bulimulus sporadicus (two adults and one tiny juvenile) were found beneath a dried palmetto frond in the drainage ditch between the postal facility and Beach Boulevard. It's uncertain how the snails got to this particular location. It should be noted that this particular location has been monitored on a periodic basis since December, 2006 and no Bulimulus had previously been found site image. During a field survey on 6/2/2015, Bulimulus sporadicus were found adjacent to the Rock-Tenn recycling facility at 9469 Eastport Road which is just north of Heckscher Drive. The snails were found clinging to the privacy fence surrounding the facility and were present on both the east and west sides of Eastport Road. The snails were apparently transported to this location by the heavy truck traffic which transverses the area site image. During a field survey on 8/12/2015, Bulimulus sporadicus were found adjacent to a True Value Hardware building in downtown Keystone Heights, southern Clay County, Florida. A modest number of living specimens (including juveniles) and empty shells were present site image. Several Bulimulus were also found near a Dollar General store close by. How the Bulimulus got to the small town of Keystone Heights (population 1,396) remains a mystery but truck traffic to the hardware store may be responsible image of specimens. During a field survey on 8/23/2015, one empty Bulimulus sporadicus shell and fragments of at least one other specimen were found in the roadside swale on the south side of International Golf Parkway (AKA Nine Mile Road) near the intersection with US-1 and the Florida East Coast Railroad tracks, St. Johns County, Florida. The site was revisited on 8/27/2015 and four living Bulimulus, including a tiny juvenile, were found proving that a viable breeding population is present. This is the only known location where Bulimulus sporadicus have thus far been found in St. Johns County site mage and image of specimens. Acting on a tip from a local businessman on 12/8/2018, even more Bulimulus were discovered at his property on Industry Place just south of International Golf Parkway which indicates that this population is larger and much more widespread than initially believed. During a field survey on 9/26/2015, Bulimulus sporadicus were found on the concrete bridge structure of the Interstate 295 overpass spanning the north-south running CSX Transportation railroad tracks near Collins Road in far western Duval County. This location is about half way between Wells Road railroad crossing (Orange Park, Clay County) to the south and the Collins Road railroad crossing (Jacksonville, Duval County) to the north. The snails were present on both the east and west side of the tracks site image. During a follow-up visit to the area on 12/7/2015, about half a dozen empty Bulimulus shells were found in a drainage ditch near the Wells Road CSX Transportation railroad crossing in Orange Park. During a field survey on 10/11/2015, Bulimulus sporadicus were found on the concrete bridge supports of the Interstate 295 overpass spanning Alta Drive in northern Duval County. The snails were present on only the east side of Alta Drive and in very modest numbers site image. In an E-mail of 10/12/2015, Mr. John Slapcinsky, Malacology Collection Manager at the Florida Museum of Natural in Gainesville, Florida reported finding Bulimulus sporadicus in the Florida Panhandle near Panama City and Polk County southwest of Orlando (no further information). In an E-mail of 11/12/2015, Mr. F. Matthew Blaine reported finding Bulimulus sporadicus on metal poles just inside the gates of the Port Malabar Rifle and Pistol Club range (GPS: 27.59264N 080.42816W) in Brevard County, Florida image of specimens. During a field survey on 12/13/2015, Bulimulus sporadicus were discovered at the CSX Transportation railroad crossing on Loring Avenue in Orange Park, Clay County, Florida. Two living specimens and a few empty shells were found in sparse vegetation site image. During a field survey on 6/15/2016, Bulimulus sporadicus were found on the concrete bridge supports of the Interstate 295 overpass spanning Pulaski Road in northern Duval County. The snails were present on all eight supports as well as the roadside swale along Pulaski Road image of specimens. Anton, the son of Jacksonville Shell Club President Brian Marshall, discovered Bulimulus sporadicus crawling across the sidewalk on the east side of Max Leggett Parkway near the University of Florida Health facility on an unspecified date during June, 2016. This location is a few miles east of Jacksonville International Airport where authorities had previously reported finding the snails during May, 2015 and is the northernmost location in the county where the snails have thus far been found. On 6/24/2015 this reporter visited the Max Leggett Parkway site and confirmed that a large Bulimulus sporadicus population was present on both the east and west sides of the road site image image of specimens. During a field survey on 7/23/2016, Bulimulus sporadicus were found on the concrete bridge supports of the Interstate 295 overpass spanning Davis Road near Bubba Lane in northern Duval County. Only four snails (all alive) could be located in the area suggesting that they were recent arrivals site image. During a field survey on 9/30/2016, Bulimulus sporadicus were found in a field near the intersection of Arlington Road and Cesery Terrace in the Arlington Section of Jacksonville. A modest number of living specimens and one empty shell were seen site image image of specimens. The site was revisited on 10/19/2016 and an additional modest number of living specimens and empty shells were found along the field periphery as well as on three walls of the Arlington Animal Hospital which adjoins the field. During a field survey on 10/28/2016, Bulimulus sporadicus were found on a concrete wall at the intersection of north Main Street with the 20th Street Expressway (AKA Martin Luther King Jr. Parkway) in downtown Jacksonville. A moderate number of live specimens were present as well as empty shells site image. During a field survey on 11/3/2016, Bulimulus sporadicus were found along CSX Transportation railroad tracks in downtown Baldwin, Duval County, Florida. Both live specimens and empty shells were present along the tracks at the dead end of West Oliver Street near the U. S. Post Office. Over the preceding several years this same location had been surveyed for Bulimulus and no specimens could be found site image image of specimens. On 2/22/2017 during a medical appointment at the Samuel Wells Medical Complex on Samuel Wells Drive near Memorial Hospital, both adult and juvenile live Bulimulus sporadicus were found in a grassy area immediately adjacent to the parking lot for building 500. This reporter has periodically visited the facility for about ten years and never before found the species. The medical complex area had been undergoing major construction for over a year thus it appears likely that the arrival of the snails may be related to landscaping which accompanied the construction project site image image of specimens. During a field survey on 3/19/2017, Bulimulus sporadicus were found near the CSX Transportation railroad tracks on the east side of Lane Avenue just south of Commonwealth Avenue in downtown Jacksonville. A modest number of live specimens, both adults and juveniles, were present. This location had been surveyed previously in the 2014-2015 period and no Bulimulus were found site image image of specimens. Posting on the Jacksonville Shell Club Facebook page on 5/2/2017, Biologist Jason Seitz reported finding a series of empty Bulimulus sporadicus shells in a drainage ditch in northern Gainesville, Alachua County, Florida during the month of April. Mr. Seitz's posting was accompanied by an image of specimens found. In an Email of 6/21/2017, accompanied by images, Torben C. Abbott in Seminole County, Florida reported that he had a metal building that was inundated with Bulimulus sporadicus and wanted to know how to get rid of the snails. He reported that the snails had appeared within the past year and were present on the building as much as 20 feet off the ground. During a trip to the grocery store on 7/13/2017, a large Bulimulus sporadicus population was discovered on the eastern concrete block wall of a small shopping center on the northeast corner of the intersection of Cortez Road with Beach Boulevard. Interestingly, the snails had climbed the wall to a height of about 20 feet above ground level and were present on the east, north and west sides of the building. An adjacent smaller building further west on Beach Boulevard also had Bulimulus present but in much smaller numbers. The location of this find, 15 feet from a well traveled road, is a location that this reporter passes several times each week and no snails were ever seen at this locality. Additionally, a review of Google Street View imagery of December, 2016 does not indicate any snails were present site image image of specimens. During a molluscan field survey on 9/12/2017, a pair of juvenile Bulimulus sporadicus were discovered beneath vegetation in a vacant lot immediately adjacent to Point Meadows Road just north of Baymeadows Road in southeastern Jacksonville. This location had been surveyed on numerous occasions over the past nine months and Bulimulus had not been found previously site image image of specimens. During an early morning walk on 9/14/2017 following Hurricane Irma, a single large Bulimulus sporadicus was discovered crawling across the sidewalk in a residential area along Cortez Road in southeastern Jacksonville. This reporter has walked this route along Cortez Road on a near daily basis for over six years and this is the first Bulimulus that has been found. A month later on 10/16/2017, a second much smaller specimen was found in the same general area beneath a dry palm frond. A large population of the species was also found along Cortez Road in a commercial area some three miles away on 7/13/2017 site image image of specimen. During a field survey on 9/20/2017, a population of Bulimulus sporadicus were found on a commercial buildings and telephone junction box on the east side of Anniston Road just north of that thoroughfares intersection with Beach Boulevard. A modest number of specimens were seen site image Image of specimens. During a trip to the grocery store on 9/29/2017, a population of Bulimulus sporadicus were discovered a the concrete bridge support of the Interstate 295 overpass spanning Gate Parkway in southeastern Jacksonville. The snails were also present in the grass nearby site image Image of specimens. On 1/11/2018 Marlo Krisberg, an employee of NASA at the Kennedy Space Center in Brevard County, reported finding many Bulimulus sporadicus at that facility earlier in the week. The snails were reportedly on a sidewalk with expansive grassy lawns on eitther side. During the same time period Mr. Krisberg also discovered Bulimulus sporadicus on a concrete pad at Rotary Park on Merritt Island - some 22 miles south of the Kennedy Space Center find Image of specimens. During a field survey on 2/24/2018, a small population of Bulimulus sporadicus were found adjacent to the CSX Transportation railroad tracks along Eastport Road just east of the intersection of that thoroughfare with Industry Drive (GPS: 30.264719N 081.373904W). A modest number of live specimens were present but no empty shells were seen. site image Image of specimens. During a field survey on 3/10/2018, Bulimulus sporadicus were found in the roadside swale near the CSX Transportation railroad tracks at the intersection of Zoo Parkway and North Main Street site image Image of specimens. During a field survey on 3/10/2018, a large population of Bulimulus sporadicus was found on the north end of Blount Island near Blount Island Boulevard and the railroad spur line serving the facility. Blount Isiand encompasses about 2,000 acres of land containing a large marine terminal serving both civilian and military operations and involves ships as well as railroad and truck traffic site image Image of specimens. During a field survey on 3/30/2018, a small number of Bulimulus sporadicus were found at a CSX Transportation Railroad crossing on Old Kings Road in Dinsmore (GPS: 30.243953N 081.453036W - WGS-84 Datum) - also known by CSX Transportation as "Dinsmore D." A single live specimen and several empty shells were seen site image. In an E-mail of 5/4/2018 Dr. Jose Leal of the Bailey Mathews National Shell Museum (Sanibel Island, Florida) reported that on 4/22/2018 a member of the museum staff, Lorin Buckner, found Bulimulus sporadicus on roadside vegetation in Lee County near the Hendry County line (GPS: 26.43541N 081.33933W). Image of specimens. Lorin also reported that he had found the species near a drainage ditch a block from US-41 in Fort Myers (GPS: 26.43540N 081.33933W). During a field survey on 5/28/2018, a very large widespread Bulimulus sporadicus population was discovered in the general area of the Florida East Coast Railroad crossing on Greenland Road just east of US-1. The Bulimulus were present on all four quadrants of the crossing and extended west along Greenland Road and into a nearby residential area (Fayal Drive and Columbia Parkway). In years gone by this site was surveyed for Bulimulus and none could be located site image Image of specimens. During a field survey on 6/8/2018, a small population of Bulimulus sporadicus were found adjacent to the Florida East Coast Railroad crossing on Shad Road immediately west of Philips Highway. About a dozen live specimens were found beneath a discarded piece of cardboard adjacent to the railroad tracks and a single aestivating specimen was also found on the railroad signaling equipment near the road. This site was surveyed in the past and no Bulimulus were found site image Image of specimen. During a field survey on 6/8/2018, a large population of Bulimulus sporadicus were found near the State Road 9B exit ramp to Philips Highway. The snails were initially spotted on the concrete curb on the exit lane to northbound Philips Highway. Further investigation revealed that the population extended for at least several hundred yards northwest along Philips Highway in the northeast swale site image Image of specimens. During a field survey on 6/10/2018, a small population of Bulimulus sporadicus was found at the Florida East Coast Railroad crossing on Atlantic Boulevard near Perry Place in San Marco. Most of the specimens seen were juveniles site image Image of specimens. During a field survey on 6/10/2018, a small population of Bulimulus sporadicus was found at the Florida East Coast Railroad crossing on St. Augustine Road just west of Philips Highway site image/image of specimens. During a field survey on 6/10/2018, a large population of Bulimulus sporadicus was found at the Florida East Coast Railroad crossing on Emerson Street just west of Philips Highway site image. During a field survey on 6/27/2018, a Bulimulus sporadicus population was found on and near the concrete bridge supports underneath the Interstate 295 overpass over Heckscher Drive (also known as State Road 105 or Zoo Parkway). A cursory examination of this location had been made in the past and no Bulimulus were found site image. During a field survey on 7/1/2018, a Bulimulus sporadicus population was found near the Interstate 295 overpass spanning Dunn Creek Road. A modest number of living specimens were present but empty shells were abundant site image. During a trip to the grocery store on 7/2/2018, a small Bulimulus sporadicus population was found beneath the Interstate 295 overpass spanning Baymeadows Road. Less than a dozen live specimens and no empty shells were seen site image. During a trip to the grocery store on 7/6/2018, a large Bulimulus sporadicus population was found beneath the Interstate 295 overpass spanning Theresa Drive. This location had been surveyed in the recent past and no Bulimulus were found site image. A follow-up visit to the site on 3/22/2019 revealed that the Bulimulus population in the area was widespread with the snails in the swales on both the east and west sides of Interstate 295 as well as in the median. Snails were found within a few feet of the Interstate 295 travel lanes. During a field survey on 7/15/2018, Bulimulus sporadicus were found near the Florida East Coast Railroad crossing near the intersection of Old St. Augustine Road and US-1. Three living specimens were discovered beneath a small piece of man made debris adjacent to the railroad tracks. No empty shells or additional live specimens could be found site image. During a field survey on 7/18/2018, a small population of Bulimulus sporadicus was found near the Baymeadows Road overpass spanning the Florida East Coast Railroad tracks. Live shails were found on both the concrete overpass supports as well as under debris immediately south southeast of that location site image. During a field survey on 7/18/2018, a small population of Bulimulus sporadicus was found at the Florida East Coast Railroad crossing on Sunbeam Road just west of Philips Highway. Live shails were found on both railroad infrastructure and under debris in the same area site image. During a field survey on 7/24/2018, a Bulimulus sporadicus popullation was found on and near wooden guardrail supports in the roadside swale within the 9300 block of Philips Highway just northwest of Shad Road site image. During a field survey on 7/29/2018, a Bulimulus sporadicus popullation was found on the back wall of a large commercial building housing Main Event Entertainment on Mussells Acres Road immediately adjacent to the Florida East Coast Railroad crossing site image. The commercial building is directly southwestwest of The Avenues Mall. During a morning walk on 8/13/2018, a single live adult Bulimulus sporadicus was found crawling in the roadside swale on the corner of Agave and Cortez Roads site image. This particular location has been perused on a near daily basis since 5/25/2010 and today's find is the first indication that the species was present. Since this is the third Cortez Road location where Bulimulus sporadicus have been found, it now appears possible that the species may have colonized the entire length of the road (approximately two miles). During a morning walk on 8/18/2018, a Bulimulus sporadicus population was found immediately adjacent to the Budget Rental Car facility at 10246 Atlantic Boulevard just west of Cortez Roads site image. A modest number of both live adult and juvenile specimens were present. This particular location has been perused on regular basis for about eight years and no specimens were ever found. Subsequent investigation several days later revealed that the species had also colonized at least two residences nearby on Cortez Road including 1642 Cortez Road. In an Email of 8/29/2018, Mike who resides on Cottbus Ave NW in Palm Bay, Brevard County, Florida reported finding a pair of Bulimulus sporadicus on vegetation near his mail box. He stated that he had lived at this location for 15 years and had never seen the snails previously. The digital image accompaning the Email confirmed the species identification. Subsequently on 9/9/2018, an Email was received from Krissy Burell in Palm Bay reporting another apparent large population of Bulimulus sporadicus in the southwest part of town image of specimens. During a field survey on 9/25/2018, a large Bulimulus sporadicus popullation was found near the First Coast Railroad crossing on State Road A1A just west of that thoroughfares intersection with US-17 in downtown Yulee, Nassau County, Florida. This reporter had thoroughly surveyed this exact location several years previously and no Bulimulus were found site image. A follow-up visit to Yulee on 9/27/2018 revealed a second much smaller Bulimulus population near the First Coast Railroad crossing on US-17 about a 1/4 mile away. During a field survey on 9/27/2018, a small Bulimulus sporadicus population was discovered on an abandoned building on the east side of US-17 (15249 North Main Street) about 100 yards south of the intersection of that thoroughfare and Pecan Park Road. The general area of the intersection of Pecan Park Road and US-17 near the CSX Transportation railroad crossing was surveyed several years previously and no Bulimulus were found site image. In an Email of 10/15/2018, Denise Fairbanks reported finding a single Bulimulus sporadicus near Lake Idamere in Tavares, Lake County, Florida on the previous day. The snail was found in the native plant garden in front of the tennis court/track. Ms. Fairbanks enclosed an image which confirmed the identification. During a road trip on 11/25/2018, Bulimulus sporadicus were discovered in the roadside swale (GPS: 30.094008N 081.303642W) on the west side of State Road 9B about 1 1/2 miles north of that thoroughfares intersection with Philips Highway (US-1). Four living adult snails were discovered beneath a large piece of discarded cardboard site image. During a visit to the dentist on 2/8/2019, a thriving Bulimulus sporadicus population was discovered along Golfside Drive adjacent to the abandoned Baymeadows Golf Course which is just north of Baymeadows Road one block east of Interstate 95. The snails were present beneath the many dried palm fronds in the area site image. During a visit to the bank on 3/18/2019, a small Bulimulus sporadicus population was discovered along St. Johns Bluff Road at the location that thoroughfare is spanned by the Interstate 295 overpass. The snails were discovered beneath downed dried palm fronds on the west side of St. Johns Bluff Road just north of Bradley Road image of specimens. In an E-mail of 3/18/2019, Mr. David Rakes reported finding unidentified snails at his place of employment at 4630 NE 35th St, Ocala, Marion County, Florida. Images accompanying the E-mail revealed the unidentified snails to be Bulimulus sporadicus image of specimens. During a field survey on 3/30/2019, a small Bulimulus sporadicus population was found on the southbound exit ramp from Interstate 95 (I-95) to County Road 210 (CR-210) in northern St. Johns County, Florida. The snails were found beneath downed dried palm fronds between the exit ramp and the (I-95) southbound travel lanes site image. On 4/13/2019, this reporter accompanied by Dr. Francisco Borrero of the U. S. Department of Agriculture also found Bulimulus in the same type of habitat on the I-95 northbound exit ramp to CR-210. During a field survey on 3/31/2019, Bulimulus sporadicus were found along Lost Pine Drive beneath the Interstate 295 overpass spanning that thoroughfare. Half a dozen fresh empty shells were found and are believed to have originated on a steep embankment inside a fenced area and washed down to the location they were found by rainfall. The empty shells were present on both the north and south sides of Lost Pine Road site image/image of specimens. During a field survey on 4/6/2019, a Bulimulus sporadicus population was found on the southside of Regency Square Boulevard North where that thoroughfare is spanned by the Southside Connector - just north of the Regency Square Mail. The snails were found on both concrete bridge supports and beneath downed dried palm fronds nearby site image/image of specimens. During a field survey on 4/8/2019, a Bulimulus sporadicus population was found along Interstate 295 at that thoroughfares intersection with J. Turner Butler Boulevard. The snails were found both along the interstate and under downed dried palmetto fronds on a hill between the interstate and adjacent overpass. Only a small portion of the area was surveyed and it's likely that the Bulimulus population is much more widespread site image/image of specimens. Map showing Duval County Bulimulus sporadicus south of the core city of Jacksonville. The snails were initially discovered near Florida East Coast (FEC) Ralroad tracks, but as of August, 2018 are now making their appearance in other areas.